We’ve seen this kind of thing before from the chaps at CNet’s UK edition: a battle of the handhelds, this time featuring the Newton MessagePad and the iPhone. The Newton, a device older than Jamie Lee Curtis, has both copy and paste, a global search function and the ability to multitask. When it first emerged, the iPhone had none of these things and not even the iPhone 3GS — the daddy of all iPhones — can properly handle more than one application at a time. I won’t ruin the ending for you, but it’ll probably come as a (contrived) surprise. I did my own head-to-head battle quite a while ago, but what I missed out on was the fun boxing graphics. Now I know. Posted by davelawrence8 at 3:52 pm on November 27th, 2009. No comments... » Categories: ipod/iphone, newton. 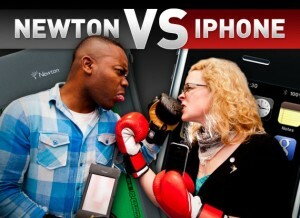 Tags: battle, cnet, eMate, head-to-head, iphone, itouch, messagepad, newton, UK. Subscribe via RSS. The Web is awash with visions of a forthcoming Mac netbooks, or an iPhone with a keyboard, or simply a mobile Mac that’s less expensive than the current product line. All of these imaginings are as likely as one made by an Apple thinktank some 20 years ago and another by the Onion. The Onion piece is the great MacBook Wheel, and the 20-year-old project is Sculley’s dream of a truly personal digital assistant. One big difference between the eMate and the XO are their screens. The eMate had a small backlit LCD that offered 16 shades of gray and a 480×320-pixel resolution. The XO provides a full-color 7.5-inch LCD with 1,200×900 resolution. Remember that the XO supports a web browser and the eMate didn’t. He goes on to say that the price different between a new eMate and a new XO are significant. Seems the eMate is Apple’s evidence for thinking small, rugged, and affordable for whatever the situation – netbooks or third-world rescue efforts – calls for. Posted by davelawrence8 at 6:12 am on August 24th, 2009. No comments... » Categories: eMate. Tags: cnet, eMate, knowledge navigator, netbook, newton, OLPC, XO. Subscribe via RSS. If the thought of busting open your Newton MessagePad to see what’s inside makes you squeamish, head to CNet’s “Cracking Open” photo tour. They show what an original Newton (OMP) looks like from the inside. It’s like Grey’s Anatomy for the PDA world. Posted by davelawrence8 at 6:48 am on January 14th, 2008. No comments... » Categories: messagepad. Tags: circuit, cnet, cracking, inside, messagepad, newton, open. Subscribe via RSS.